So here it is, possibly the holiest of holy cows. It’s not that I don’t like Pet Sounds – I do – it’s that I don’t love it, though I feel I’m supposed to. God only knows I’ve tried; I’ve owned it for half my life, and must have listened to it hundreds of times, on top of the number of times one must be passively exposed to songs like God Only Knows and Wouldn’t It Be Nice, which permeate the culture like very little else can. My wife loves it. Many of my musically inclined friends love it. Many of the musicians that I do love, love it. Much of the music that I would call my favourite ever music is massively, enormously indebted to it. But it just never clicked for me. So while I find the rollicking drums of I’m Waiting For The Day exciting and pleasurable, I find Don’t Talk (Put Your Head On My Shoulder) and You Still Believe In Me to be just a little… dull. And I hate using words like dull, tedious, and boring to describe music, because they’re so undescriptive, so subjective, so lacking in specificity. And those instrumentals, they’re just… twee, and bland, and pointless. I can listen to the likes of Stars Of The Lid or The Necks for hours on end, but I just don’t get these. Maybe it’s that it’s in mono, maybe it’s the slightly crunchy, wall-of-sound-ish edge to the production. Maybe it’s that The Beatles got me first, and The Beach Boys never had a Rain or a Tomorrow Never Knows, never had that dark, psychedelic edge. Maybe it’s the fact that Brian Wilson, for all his alleged infidelities and obsessive tendencies, here just produced a batch of nice, quite pretty, but ultimately emotionally immature love songs. They just don’t really move me; I don’t find the melodies pretty like I do those of songs like Something Like You by Michael Head & The Strands of Switching Off by Elbow, songs that also seem, to me, possessed of an emotional depth that I just can’t find here. I’m intrigued by the relationship between familiarity and enjoyment, the idea that if you listen to anything often enough then recognition and association will supersede any kind of aesthetic response. I’m not sure what my relationship with Pet Sounds says about this idea; do I only like I’m Waiting For The Day through familiarity? Why don’t I, in that case, like Caroline, No, then? Why don’t I really love any of it? Tom Listened: It’s inevitable that Pet Sounds is going to be compared to Revolver (or mid-period Beatles in general) such was the transatlantic competition between the bands’ major songwriters at the time, but the albums themselves bear no comparison…they are the aural equivalent of chalk and cheese. Brian Wilson had a completely different agenda to Lennon & McCartney at the time and sought to innovate in a different way. It seems to me that, on the whole, The Beatles were all about looking forward, pushing the musical envelope and forever searching for sounds/songs the like of which had never been heard before. The Beach Boys innovated by looking back. Sure they didn’t write a Tomorrow Never Knows, but then Lennon & McCartney didn’t write God Only Knows! Which is better? Probably only one way to find out…FIGHT. Even at its most effervescent (which it certainly is not on Pet Sounds), the Beach Boys’ sound is a wistful, nostalgic take on adolescence. On Pet Sounds their music is superbly crafted melancholic pop; each gem a polished diamond, practically every note evocative of the sun setting over golden sands as you suddenly realise that it’s the end of August, soon the nights will be drawing in, the carefree life will be gone and the drudgery of the Autumn months will be upon you. It’s the sound of Brian Wilson falling apart, but still sane enough to realise his predicament. It’s a different way of letting the world know you’re finding things hard than shouting for Help; certainly more subtle, possibly more affecting. I love Revolver for the place it had in my own musical development, I love its wacky sounds and its bright and breezy pop, but it certainly has its share of clunkers. 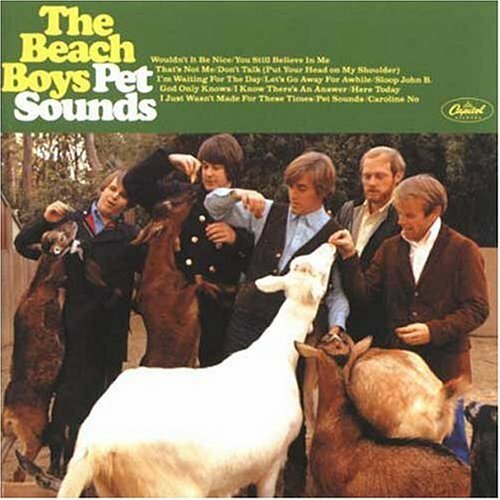 But I love Pet Sounds for its depth, its courage and for the fact that it doesn’t reveal its majesty too easily. I love Pet Sounds in a way that Nick doesn’t (and probably never will) but then I always was a sentimental old fool! Graham listened: Always good to look to the present and most recent prime minister for an apt quote on the the Beach Boys. I’m afraid “I agree with Nick”, is pretty much where I’m at on this one. I’ve tried to find the depth in this that others can find, but just not there for me. Rob listened: I’m closer to Nick’s position on this. I’ve tried several times and never really managed to stick with ‘Pet Sounds’. I’m happy to take the lion’s share of the blame for that but come on guys, give me something to work with apart from the songs I can hear three times a day just by accidentally tuning in to Radio 2. I haven’t listened deeply enough to make my mind up once and for all, but i’m not sure how many more times i’ll feel drawn to go back.